When a downtrend ends, the next move may be an uptrend. You want to get in on the action as early as possible, so you care when a downtrend is broken to the upside. You may someday do the unimaginable — sell short (selling a security first and buying it back later after its price has fallen). This figure shows two resistance lines drawn according to the rule. The uppermost line correctly advised shorting this security at the third touch of the line. The price falls off the cliff. But the price never returns to this first resistance line. 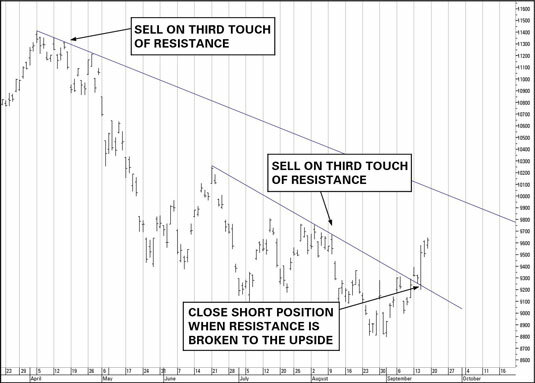 Instead, you get the opportunity to draw a new resistance line a few months later. An experienced trader would probably see the new line as an opportunity to increase her short position. A long-only trader would be watching this second resistance line for the opportunity to buy the security — with a holding period that lasts only until the price nears the topmost resistance line, where it will face (you guessed it) resistance. The more times the high-of-the-day touches the resistance line and doesn’t cross it, the more confidence you have that it is a valid description of the trend. This action is called a test of resistance and encourages sellers of the security to sell more after the price passes the test. Fresh selling constitutes supply of the security and is called distribution. Those who own the security are reluctant to hold it after resistance was proved to resist an effort to break above it. They’re willing to sell their inventory at increasingly lower prices.